EPITAXX, Inc monitor is designed for applications that require monitoring in the extended DWDM band, the L-Band. The EPM 606 L-Band InGaAs PIN Photodiode Module offers high responsivity in the C-band 1550 nm (0.85 A/W min.) and in the L-Band at 1625 nm (0.80 A/W min.). Other features of the product are low back reflection of –40 dB, maximum, and low dark currents of 0.6 nA. The EPM 606 monitor is available with a 1.25-meter length of 8.7/125 µm single mode fiber with a 250 µm bare fiber pigtail or with a 900 µm outer jacket. The fiber is reinforced with a rubber boot, which relieves fiber-bending stress. 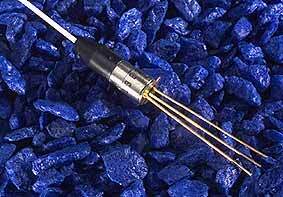 The photodiodes are packaged in a compact, rugged, stainless steel coaxial package that can be mounted on a PC board or panel. An optional mounting bracket can accommodate systems that require vertical or horizontal mounting of monitors.